Non-native Phragmites australis is a highly invasive wetland grass in North America, and managers across the Great Lakes basin are working to control it. However, practitioners have reported difficulty in collaborating across the Phragmites community. Thus, the Great Lakes Phragmites Collaborative (GLPC) was formed to support managers in achieving their diverse management goals. Since its formation in 2011, the GLPC has strived to apply a collective impact approach to organize and empower Phragmites-related activity throughout the basin. Major accomplishments include a website (http://greatlakesphragmites.net/) that acts as the central resource hub, research- and management-focused webinar series, newsletters and blog posts, a 600-member listserv, a dynamic mapping tool, and the creation of the Phragmites Adaptive Management Framework (http://www.greatlakesphragmites.net/pamf/). Through a common agenda, the GLPC will continue to reflect stakeholder-identified goals, create and distribute dynamic resources to meet those goals, enhance communication and alignment of managers, and promote multi-year management and restoration planning. 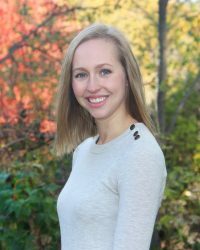 Samantha is a Program Specialist with the Great Lakes Commission in Ann Arbor, MI. She coordinates the Phragmites Adaptive Management Framework (PAMF), a program designed to work with Phagmites managers across the Great Lakes basin in an effort to reduce the uncertainty and increase efficiency of Phragmites management actions. Samantha earned her Master's and Bachelor's degrees in the Fisheries and Wildlife Department at Michigan State University.